If you love chicken wings and are looking to take the family out for lunch or dinner then stop by Knuk N Futz in Taylor Mill. If you blink you might miss this unassuming building on Taylor Mill Road, so keep your eyes open so you don’t miss one of Northern Kentucky’s hidden gems when it comes to wings, or as they call them at Knuk N Futz, Wingz. For years I’ve driven by Knuk N Futz in Taylor Mill and I always sort of assumed it was a bar, but recently I started hearing folks talk about it more and more and realized it’s a restaurant. AND it’s a family friendly restaurant! 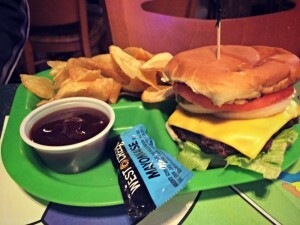 They offer a great kid’s menu with reasonably priced items, and they serve the kids pretty large portions. One of my biggest gripes is restaurants who don’t serve enough food on a kid’s plate, which leads to a whiny kid during dinner. This is NOT a problem at Knuk N Futz. The meals were very hardy! Knuk N Futz is known for their Buffalo Wings, and I can now attest that they are delicious! 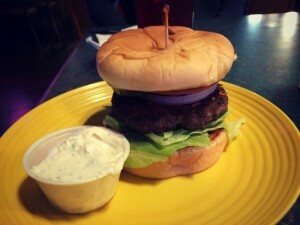 They also offer other sandwich options, salads, burgers and more. 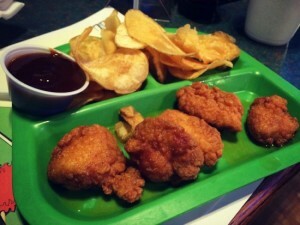 But seriously, try the wings….with one of the many different variations they offer. 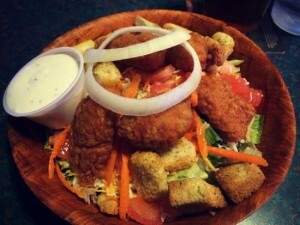 I had boneless buffalo wings on a salad and it was great. 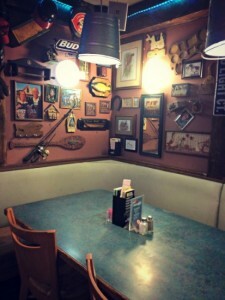 The inside of Knuk N Futz is decorated with a hodge podge of different items adorning the walls. They have everything from beer signs to classic works of art. My favorite piece of décor though is the inside of the ladies room’s stall door. 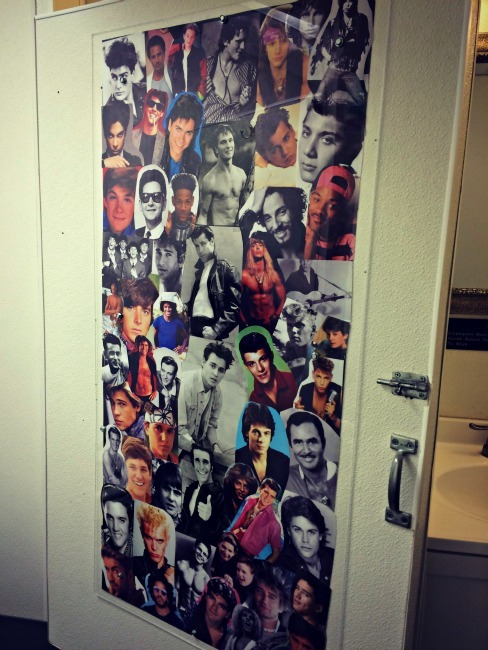 It’s decorated with a collage of hunks from the 80’s and 90’s. So you can stare at Patrick Swayze or Johnny Depp while you take care of business. It made me laugh so of course I had to snap a picture! Knuk N Futz offers specials throughout the week in addition to their already reasonable menu. Visit the Knuk N Futz website to view specials, menu items and get other information such as hours of operation. 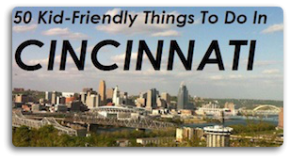 Next time you are in the NKY area stop by Knuk N Futz for some wings! I am not a wing person , but when they came came out with their ruba dub dry rub wings I tried them and loved them. The wings are awesome and their blue chz is by far the best. Kevin ,Kelly and the staff are awsome as well.